Bigfanboy.com and CBS Films want you to see THE KINGS OF SUMMER at a special advance screening in Dallas, TX. 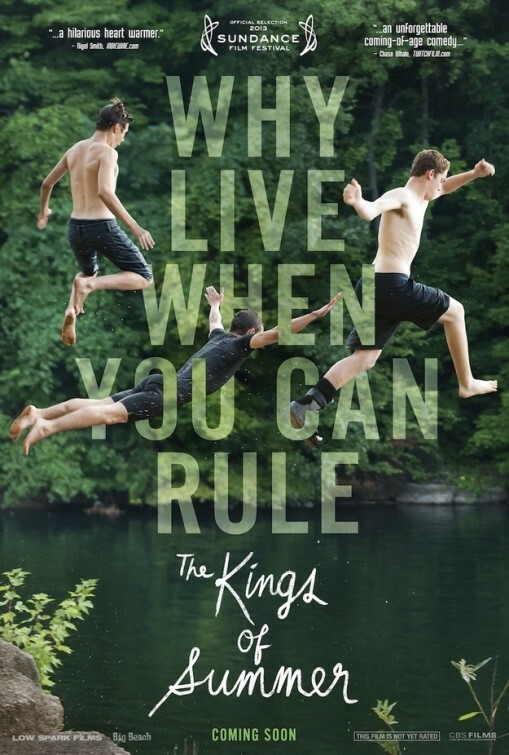 It stars Nick Robinson, Gabriel Basso, and Moises Arias as three young men who boldly run away from their homes and high school lives to live in the woods as “men” and brave the elements. Directed by Jordan Vogt-Roberts, and going intentionally for an 1980’s Spielberg-ish feel, it also stars Nick Offerman, Megan Mullally, Alison Brie, Mary Lynn Rajskub, Kumail Nanjiani, and Hannibal Buress. We want you and guest to see this one early and for free – the screening will be held on Thursday, June 6, 2013 at 7:30pm – at Angelika Film Center in Mockingbird Station. Each pass is good for two people. NO PURCHASE NECESSARY. One pass per person. THESE PASSES ARE ONLY GOOD FOR DALLAS! The screening in on Thursday, June 6, 2013 at 7:30pm in Dallas. One print off per person please (again, your pass admits for two). Please, no trading of passes. If you’re not 100% sure you can attend, please do not print passes, as you could be taking a pass away from someone who genuinely wants to be there. These passes come to you compliments of Bigfanboy.com, and we frequently offer advance screening passes – please follow us ON TWITTER and ON FACEBOOK.